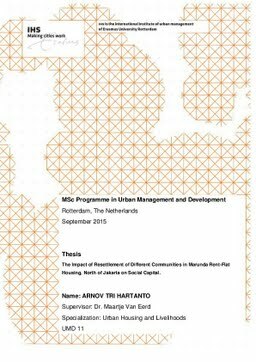 Erasmus University Thesis Repository: The Impact of Resettlement of Different Communities in Marunda Rent-Flat Housing, North of Jakarta on Social Capital. The Impact of Resettlement of Different Communities in Marunda Rent-Flat Housing, North of Jakarta on Social Capital. According to the Act no. 1 and 20 in 2011 have mandated the government and other stakeholders in order to coordinate the implementation of housing and residential flats as well as to address all the needs and anticipate future developments For last one decade, Rusunawa or rent-flat housing is become more important as one of solution developed by both of central and provincial government to provide adequate housing for poor and low middle income in order to live in better and healthy environment. Furthermore, in the framework of environmental regulation rent- flat housing is built to control and to address the slums area which majority of them are living in the green and blue open space that could generate environmental issues considering the limited land and the land prices. As a capital city which is also the most populated city in Indonesia, DKI Jakarta still facing those issues particularly the number of slums who live in the prone area such as river banks, near to railway, under the flying road, and other green open spaces. This condition is stimulated by urbanization result and the limited land with extremely high prices. In order to address those matters, DKI Jakarta plays an active role in terms of the developing the rent-flat housing for poor and low-middle income people. Moreover, the provincial government relocates the society who live in the prone area to these rent-flat housing. Resettlement is one of solutions held by government to address this issue. However resettlement is designed not necessary based on the physical, environment, and urban aesthetics reasons. Resettlement program is also designed based on economic, cultural, and social aspects side.